Hello y'all. It's beginning to look a lot like Christmas around these parts. And, believe me, I'm not mad at it. In fact, it makes me one happy lady. Next week I'll be participating in a Winter Eclectic Home Tour hosted by the sweet Jess at Domicile 37. But this week, I wanted to get the ball rolling by showing you the cheap and easy stocking holder I made. I love love love our house but one thing that I really wish it had was a fireplace. We have a brick wall...but no holes for fire. 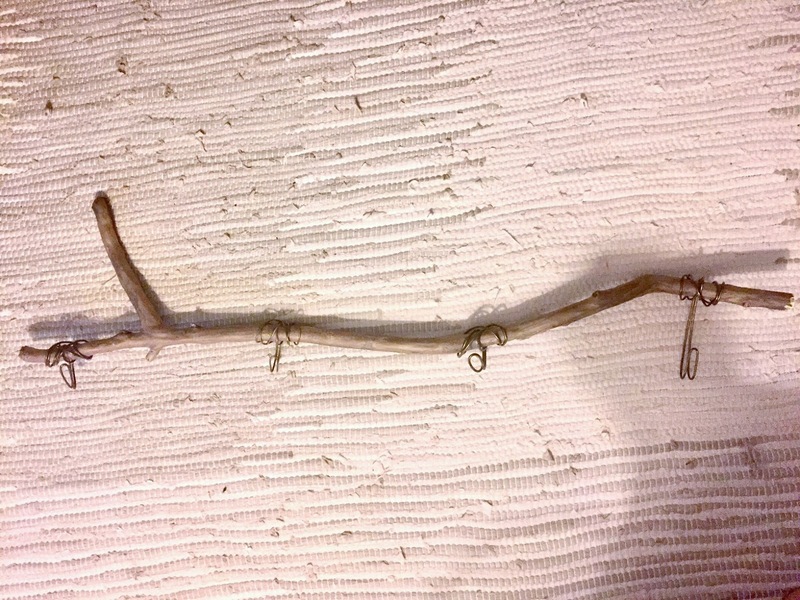 Every year I try to find cute stocking hanging solutions and this year, I decided to try my hand at making a natural looking stocking hanger using 1. a free stick from the yard. 2. free hangers from the closet 3. various pliers for cutting and bending those, thicker than they look, hangers. 4. rope hang it by. I picked hangers that were already a brass color but you can use spray paint for any look that you want. I cut the hook part off with my wire cutters and made the hanger as straight as I could and bent the wire in half from the center. I stuck the hanger behind the stick and bent the wire to make a hook. I used the pliers to hold the hook part in place and wrapped each side a few times around the stick. This is a picture of the hook from the backside. I just tucked the end underneath and later hot glued the tip so it wouldn't scratch anything. 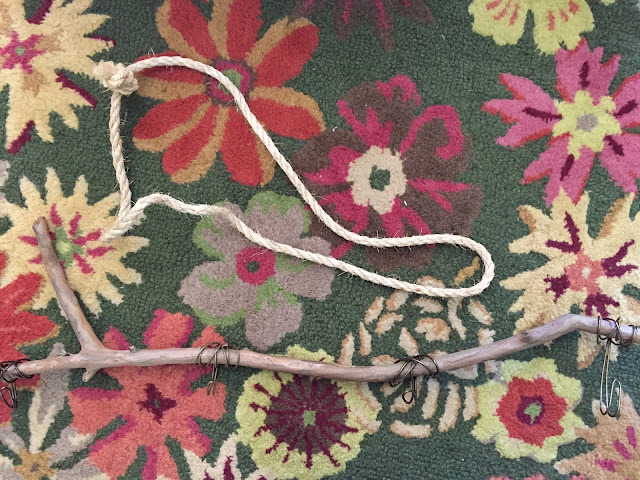 I thought about using leather to hang the stick but in my ever present need to spend NO dollars, I used rope we had in the garage. I cut a big piece and tied it in a big loop with a big knot. Clearly I did not stop my project to vacuum the picture taking area. I turned the stick over and stapled the rope to the back. Lots of times. Then I used hot glue to attach the rope to the back of the stick so it wasn't as noticeable. When I hung it on the wall, it needed a little something something. I was already making tiny holly leaves for some wreaths I made so I cut out a few big ones for this project. I'm so happy with the way it turned out! It was a bigger scale than I expected after I got it on the wall. I had plans to put it closer to the tree but I love it on this wall framed by the plates. The stockings were pottery barn kids after Christmas before we even had kids. Similar style here. I just guesstimated the amount of kids we'd have. We have one more stocking but we're good with our family of four. Make sure you stop by next week for 7,483 pictures of our Christmas home tour. Joel's gonna be so happy when I'm done taking pictures. This is such a cute idea! Sharing it as one of my featured links from the Creative Circle Link Party! Thanks so much for linking up!